Please start typing to search. Unfortunately there were no results matching your search. At a minimum, apps should provide users with a basic degree of functionality and a respectful user experience. Apps that crash, exhibit other behavior that is not consistent with a functional user experience, or that serve only to spam users or Google Play are not apps that expand the catalog in a meaningful way. We don't allow apps that spam users or Google Play, such as apps that send users unsolicited messages or apps that are repetitive or low-quality. We don’t allow apps that send SMS, email, or other messages on behalf of the user without giving the user the ability to confirm the content and intended recipients. We don’t allow apps whose primary purpose is to drive affiliate traffic to a website or provide a webview of a website without permission from the website owner or administrator. An app whose primary purpose is to drive referral traffic to a website to receive credit for user sign-ups or purchases on that website. 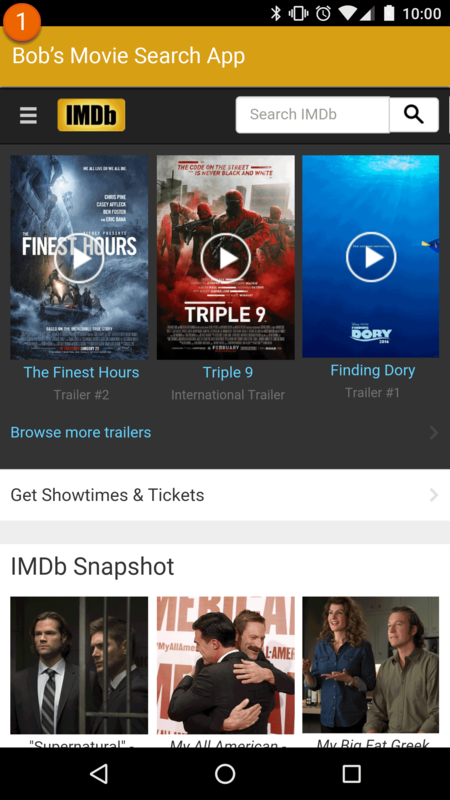 ① This app is called “Bob’s Movie Search App” and it simply provides a webview of IMDb. We don't allow apps that merely provide the same experience as other apps already on Google Play. Apps should provide value to users through creation of unique content or services. Copying content from other apps without adding any original content or value. Creating multiple apps with highly similar content and user experience. If these apps are each small in content volume, developers should consider creating a single app that aggregates all the content. Apps that are created by an automated tool, wizard service, or based on templates and submitted to Google Play by the operator of that service on behalf of other persons are not allowed. Such apps are only permissible if they are published by an individually registered developer account belonging to the user of the automated tool, not the operator of the service. We do not allow apps whose primary purpose is to serve ads. Apps where interstitial ads are placed after every user action, including but not limited to clicks, swipes, etc. Ensure that your app provides a stable, responsive user experience. We don’t allow apps that crash, force close, freeze, or otherwise function abnormally.